Visual Observer is a web-based service designed to help users monitor and track changes that are made to websites they specify. It accomplishes this by monitoring the selected sites and taking screenshots when there are changes. Email alerts with details of the changes are then sent to the user that requested the monitoring. The service provided by visualobserver.com can be used for a variety of purposes, from keeping abreast of social media updates to web development progress monitoring. The flexibility of the platform lends itself well to both personal and professional use. A variety of customizations are available, from the frequency of update to the threshold for generating an alert. For simple website change monitoring, the interface is perfect. It’s simple to navigate, easy to understand, and is presented in a very straightforward way. The account dashboard displays a weekly graph detailing the number and type of changes in a monitored site. A history tab also provides a timeline with a change percentage for a better overview of the scope and scale of the tracked changes. Visual Observer is a fast, easy to use tool for rudimentary web monitoring. It would work well for anyone who seeks to track incremental visually-detectable changes over long periods of time. It’s handy to save the user some time checking in on a site each day and trying to remember what was there the last time they looked. According to Website Rocket, their soul purpose is to provide a realistic and accessible SEO solution for small businesses and local businesses, specifically. We all know that one of the #1 issues facing many small businesses, local businesses, and startups today is the cost associated with running an effective SEO campaign. Everybody knows that in the small business world the idea of hiring a full-time SEO employee or qualified SEO service provider is completely out of the question simply because they can’t afford it! Even most of the today’s top DIY options can be quite expensive with some of them running a few hundred dollars or more each month! Running a legitimate SEO campaign (at an affordable price) is now possible for small business owners – with the help of Website Rocket. Of course, it will require some legwork on your part. Starting with step-by-step instructions Website Rocket takes small business owners (webmaster) through ESSENTIAL search engine optimization steps with incremental daily tasks. Each SEO task given to you is ordered and prioritized with easy-to-follow directions. More importantly, each task is schedule for you so that you don’t have to worry about what you need to do next. On Page Optimization coaching with SEO health checks for each page, niche link building tips, tricks and ideas, plus, website promotion tasks that included utilizing social media outlets such as Facebook, Twitter and more. Weekly blog post ideas that target longtail phrases within your niche are provided as well to not only help you keep your business current and up with the times but to help you reach lower hanging fruit and increase your overall traffic flow. Website Rocket also allows business (when initially setting up their account) to opt for a Local SEO option. Yes, you read that right! A geo-targeted SEO campaign complete with tasks that can help you to build your businesses local visibility. Many might wonder what an SEO business offering such a low priced solution could possibly have to offer their business but here’s the truth about SEO (even if today’s top SEO’s don’t want to admit it). The process of launching a new SEO campaign require a great deal of the same tasks – no matter what the niche. Yes, each task will require a slightly different approach depending on your industry but if you know this when starting it you can make these adjustments on your own – and that’s what Website Rocket will teach you! So what can you expect if you choose Website Rocket? When choosing to promote your website with Website Rocket you can move forward with an SEO campaign where each and every task that is directed is created to provide your website with a better and more organic footprint – giving your business the best possible chance of ranking high in today’s top search engines. There is do doubt that Website Rocket is one of today’s the best options when it comes to doing SEO for beginners. It was built solely with the small business owner in mind. Let Website Rocket help you “launch” your website to the top of Google utilizing the most current and most trusted industry standards. Most small business owners like Website Rocket because it’s affordable, while those who truly understand the importance of even the most basic SEO elements see Website Rocket’s value as an integral part of a long term online marketing strategy. You tube search engine optimization and the ability to get a website ranked highly in the eyes of Google is not an easy task, as Google has an YT specific algorithm that they use to rank sites, which is constantly changing and being updated to accommodate the ever changing world of the internet. One of the most productive resources in the last few years has been traffic that has been derived from YouTube videos, as this is a platform that can create a massive amount of traffic, which is organic in nature, right to your site. The reality is, that video content through sites like YouTube convert a lot better than ad copy, which is the way that people used to primarily try to get traffic to their sites. YTCockpit is a marketing tool that is used to streamline the process of finding keywords, implementing them into your site, creating solid back links that work, and driving traffic to a website. This process is incredibly difficult for a lot of people and there is no question that it can take a massive amount of time and energy, which most people are unprepared for. Because of this, YTCockpit was created to give people the ability to create a successful page and get their pages ranked more easily. This aspect of building a website truly makes or breaks whether it is successful or not, which is why it is absolutely essential to get help during these initial steps of creating a page. There are a ton of benefits of creating a YouTube channel and then creating content that directs back to your site. The first and foremost reason for this is the fact that there are currently over one billion YouTube accounts, spanning the entire globe, with just about every single country actively involved. This is an absolutely massive platform, which can be used to drive traffic to your page by leaving links, which is why YTCockpit aims at utilizing this platform. The old saying a picture is worth a thousand words applies even more in this scenario, as video is flat out better than any picture you could procure. A video lets the audience that you are speaking to get to know you and is a more personal way of creating content, which is why this type of tool can be so beneficial in building an audience of people that regularly come back to your videos, as well as your website. People flat out like listening to a person talk, as they then have the opportunity to gain insight into that individuals personality. Not only is is factually proven that a YouTube account, complete with regular YouTube videos is one of the strongest ways to get organic traffic to your site, Google also loves websites that are connected to YouTube accounts. Google actually owns YouTube, so developing a following on the site, by utilizing YTCockpit, will absolutely create high quality links that Google is going to love, which is going to end up helping to rank your site. dditionally, YouTube is a platform that really exposes people and some individuals are not comfortable having their face out on the internet on such a public platform. There are also some pretty nasty comments that can show up on YouTube videos, which is something that a lot of people do not like being subjected to. With that being said, if you do go ahead and get on board with YTCockpit, you are likely going to have more success on your page and will earn more money. There is no question that people will benefit from this product, especially those people that are just starting out. So many people end up giving up on their website, despite having a great idea, because search engine optimization is incredibly difficult. Outsourcing the process of getting ranked and driving traffic is huge and will pay off in the long run, so everyone that has a website or is thinking about building a website should check out the many advantages that are to be had by using YTCockpit. 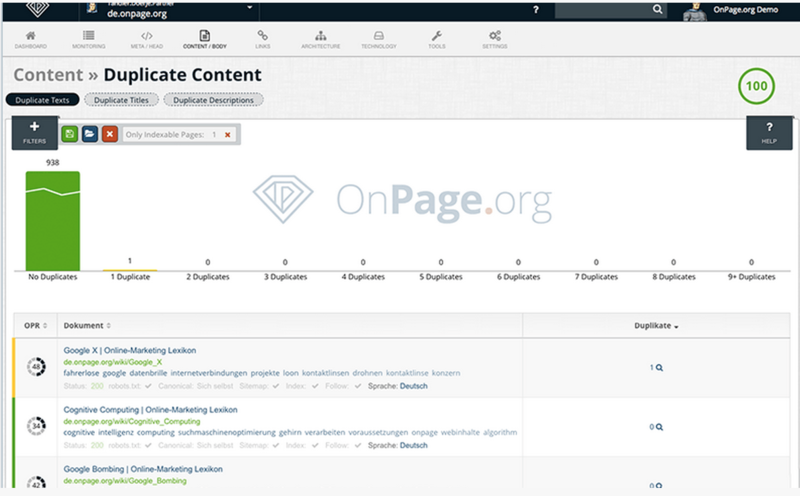 Since 2012, the German SEO tool OnPage.org has been keeping with the motto “Full speed ahead!”. The Munich-based new enterprise represents professional quality management of websites. The web-based software focuses on the substantial analysis of important OnPage criteria and the long term optimization for search engines. The substantial analysis software OnPage.org ZOOM! scours websites for error sources and optimization potentials. The crawling results are immediately being worked up for customers in an appealing and neatly arranged manner. Numerous video tutorials and useful tips help users with removing errors from the source code and assist with the use of the tool. That’s why OnPage.org ZOOM! is both suited for beginners and professionals in the field of Search Engine Optimization. The functions of the tool range from Keyword Monitoring to analyzing the entire website and internal linking structure. The OnPage.org standard package already starts from $119.90 per month. With the on-going analysis of numerous websites, an upgrade to the Business Account at $499.90 per month including up to 10 web projects is advisable. Larger packages such as “Agency” or “Enterprise” are offered as well and can also be customized. More about the packages here. The dashboard in OnPage.org ZOOM! In the tool’s well structured main navigation, reports regarding headlines, status codes, the META tag’s pixel length, use of Sitemap.xml, text uniqueness, ALT attributes, canonical tags and many more can be found. Divided into categories, the navigation provides an overview of the reports and improves the usability. With the help of easy-to-read graphics and diagrams, users can always keep an eye on the status of the on-going optimization process. The convenient filter functions are another crucial part of the tool. The TF*IDF report helps webmasters to identify relevant terms and items for the website that could play a prominent role for its ranking. The Tool works out the a Term’s Frequency within a document as compared to all other terms (TF). In doing so, all webdocuments listed among the top 10 serve as a basis. The TF*IDF text assistant analyzes already existing texts and suggests the use of certain keywords. The text assistant also determines the term frequency within new texts and suggests terms that are still missing or whether there are too many. With Mentions, OnPage.org has created a tool for brand monitoring. Like that, it can be monitored in real time where and when the own brand is mentioned and can respond directly to it. Mentions covers all common Social Media channels such as Twitter, Facebook or GooglePlus and is ideally suited for Public Relation departments. Focus not only analyzes the website’s indexability but also the Meta Tags, the most important keywords of a site based on a quick TF*IDF check, H-Tags, link targets, viewport, social links and many more. With OnPage.org, SEOs can simplify and speed up their daily workload significantly. At the touch of a button, the tool provides its users with all the error sources. Due to the tool’s ease of use and appealing user interface, it is also eminently suitable for webmasters of single websites. With the manifold support options and tutorials, users can furthermore improve their OnPage SEO knowledge and consequently also improve their website’s ranking. It’s always the same story. You think of turning a profit by creating a website for your company or by opening an online shop. Soon after you will realize that your efforts do not yield any results. Nobody visits your site because nobody knows it exists. There is a lot of competition out there for people’s attention, especially on the internet. So eventually you will come across the terms “search engine optimization” (SEO) and “link building”. And this is when you will be faced with numerous SEO tools which all promise to take your website or online shop to the top positions in search engines. But Can You Trust These Tools? First of all, anyone who claims to be able to get your website to #1 in Google & Co. simply by making use of their tool should not be trusted. Rather you should take a look at those service providers who offer to help you in making your online marketing and SEO processes more efficient and thus less time-consuming. The most remarkable tool in this regard is “a little engine that could” called linkbird. It offers a highly flexible software solution for managing your entire SEO linkbuilding, online PR and content marketing. As you probably know, a crucial factor in content marketing is reach and it is therefore important to find influencers, multipliers and other relevant websites for spreading your content across the web. Thus the Sitehunter can be used as a synonym for an automated and efficient website research process delivering valuable potential link sources for effective content seeding. When doing link building to boost the visibility of your website on the internet, however, you will soon come across webmasters that have the bad habit of agreeing to give you a backlink that they then will deactivate short after publishing. But it’s not only important to know about your link status, but also about your brand status. Brand monitoring is an indispensible part of any online marketing strategy. You need to be aware of your mentions in order to be able to react upon them and proactively build your brand. After successfully managing your links and brand mentions, you should focus on building a CRM for future content seeding campaigns and newsletter campaigns. Finally, a clear and highly diagnostic reporting is key to being able to optimize processes and tap into unused potentials. Overall, linkbird is a great All-In-One solution for your online marketing. It offers all the features necessary for smooth and time-saving workflows, efficient link building, successful content seeding as well as effective monitoring. It can be tricky at first to understand the purpose of some features, while others seem perfunctory in the beginning. But if applied correctly, this remarkable package will definitely make you fly high. Can’t wait to test the forthcoming content marketing update that’s in the making right now! Brightedge Data Cube – What’s in it for you? While the video is really beautiful, we are a little bit confused by the way Brightedge throws numbers out there. “Billions of content pieces”, “100s of terrabytes”, “big data” and “6 years in the making” sound like a pretty strong value add, but when it comes to showing samples it is not really clear what this means (we even stopped the video and saw for NBA.com the data cube kicked back “Le Bron James” and a few other expected keywords). Pulling out keywords at scale is something we’d rely on SEMRush, Wordtracker, Ubersuggest and a few other SEO products. The lifetime of (viral) content is getting shorter and shorter, so what is the magic, that is coming out of that box? Anyone? Brightedge folks? We really hope that Brightedge developed a valuable feature, which can help the SEO industry compete in the always changing SEO world. Already a few months back, but Moz launched a local product to compete in the fast-growing SMB market. In a previous post, we’ve suspected to see Moz move in the SEO enterprise market, but this didn’t seem to really happen. Their tools a great, but a lot of folks don’t think that they are exceptional, meaning other tools couldn’t provide a certain task or data in a similar way. Moz local looks solid and will compete with Yext, Placable and a bunch of other local submission services, which we’ll cover soon. With Google’s outings of link networks and the massive amount of email warnings to webmasters a completely new industry has been created. Linkrisk.com, Removeem, Linkresearchtools are the big players just focusing on that part. Also Sistrix SEO tool announced a Linkrating tool to help their clients to rank better. We’ve seen more and more tools move into the onpage business: Onpage.org seems to be one of the strongest candidates to have a big impact on the industry, but also Botify, Deepcrawl and a bunch of others try their luck capturing market share. Lately we’ve also seen an enterprise tools roll out some amazing onpage features, which should help to understand the technical onpage side better. Looking back at the past few months, we can say that the SEO tools industry stays innovative and agile in order to combat the constant changes, that the industry faces. More sophisticated tools means more specialists are needed to run them, but also an end of the small SEO shops.